Here is an opportunity to Accelerate your startup in 100 days with mentors from India, Singapore and Silicon Valley. 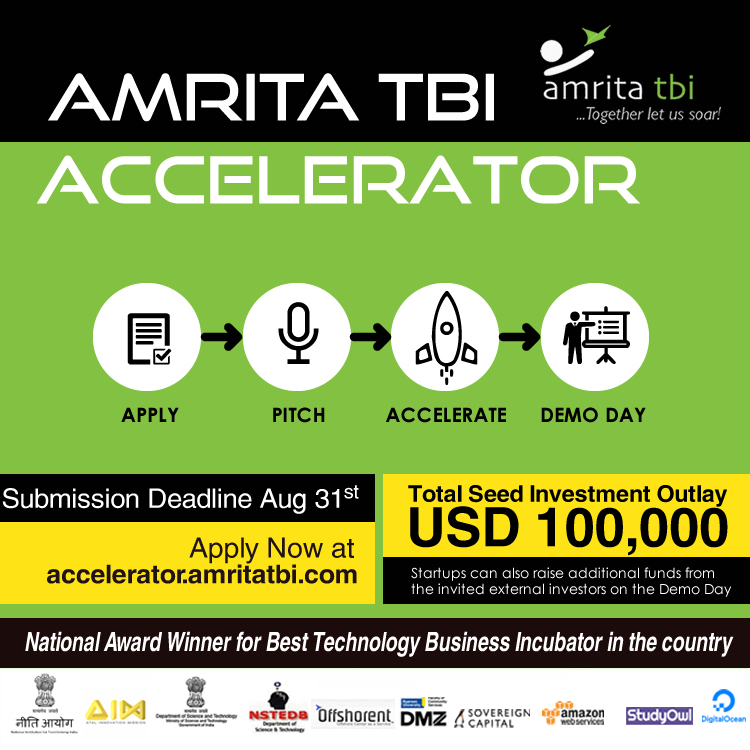 Amrita Accelerator is a 100 day fast paced program with the mix of best practices to help early stage start-ups evolve into successful ventures. The startups can raise funding from the invited external investors and Amrita TBI on the Demo Day. The Accelerator program is supported by Atal Innovation Mission, NITI Aayog and NSTEDB, Department of Science and Technology, Government of India. Total seed investment outlay $100,000 USD. All stages of startups accepted. Amrita TBI is a non-profit technology business incubator supported by DST, Govt. of India and Amrita University. We fund, mentor and nurture ideas, startups and entrepreneurs. In 2017, Amrita TBI received the National Award for being the best Technology Business Incubator in the country. Bring your Ideas to Life. Launch your startup.